Comrex’s Digital Hybrid series are high quality single- and dual-line telephone interfaces. 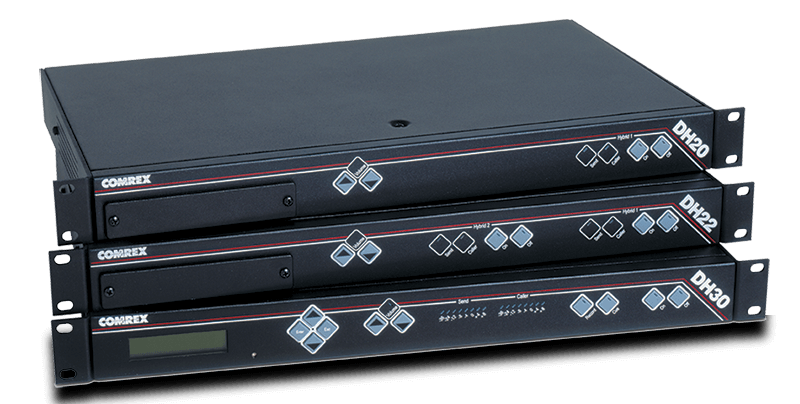 Designed to interconnect a standard telephone line and your audio equipment, the DH Series enables users to send and receive audio from a connected telephone line. When the very best audio quality is required for talk shows, news feeds, production, recording studios, or internet applications, these digital hybrids are ideal. With DSP technology, the DH20 and DH22 deliver the deepest and most stable hybrid null, ensuring maximum isolation between the send and caller audio. This means no echo or “bottom of the barrel” sound. Additionally, the DH20 and DH22 come with selectable automatic gain control (AGC) and caller ducking. With AGC, each call will be delivered to the equipment at the same level. Caller ducking reduced the caller’s audio level when the announcer speaks, providing a more “controlled” environment. Additionally, we’ve added a speaker amplifier, so you can connect a speaker directly to the unit and monitor callers without headphones. *Note: DH20 is no longer available for sale. The DH30 digital hybrid provides a high quality interface between a standard telephone line and your audio equipment. Designed with both AES/EBU and analog inputs and outputs, the DH30 works with the latest digital and analog consoles. To ensure quality sound in studios that have open speakers and microphones, the DH30 is equipped with an acoustic echo cancellation feature. The DH30’s digital signal processing (DSP) has multiple adjustable parameters to provide you with the best send and caller audio signals. New audio processing features such as the compressor and downward expander functions ensure that the best audio reaches your audience. All audio processing features are programmable via the front panel controls. For the deepest, most reliable hybrid null, and the best quality caller audio for your application, the DH30 is the answer. Easy to use and install, the DH30 has simple front panel controls and remote control capability. These controls put the On, Off, Rec, and Cue functions right at your fingertips. The DH30 also includes a 2W monitor amp with volume controls right on the front panel. The Rec function sends a start/stop signal to your external recording device. The Cue function allows you to control which audio signal should be sent to the caller, allowing you to switch from the Send input to the Cue input at the touch of a button. Adjustable caller control (ducking), three-band equalizer, compressor and expander.